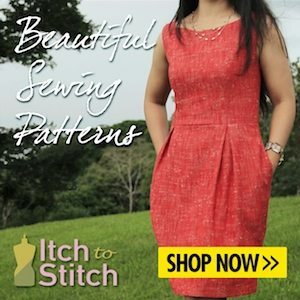 Home / Pattern Reviews / My #smyly2018 dress – another Pattydoo Chloe dress! My #smyly2018 dress – another Pattydoo Chloe dress! O.K, I know. Another Pattydoo Chloe dress. I just can’t help it, I love it so much! I recently made this as part of a contest entry over on the Pattern Review website and decided to mention it here as part of the #smyly2018 challenge. The idea of the #smyly2018 challenge is to make a garment that makes you feel good and helps the sewing community talk about positive body image and mental health issues. Whilst I have been incredibly touched with reading and listening to so many situations that other sewists have found themselves dealing with, I feel that it is still too difficult to share with you my struggles with overwhelming shyness and other issues that affect my mental health. I will say however that I agree with everyone that has taken part, in that sewing definitely makes a huge difference to me and I am constantly amazed by the support I have from fellow sewists, and that which I see shown to others. It is always important to remember that we all have struggles that we are dealing with, often unseen, and these affect us all to varying extents, but kindness costs nothing and patience with others is always something to aim for as we can never truly know what others are dealing with. 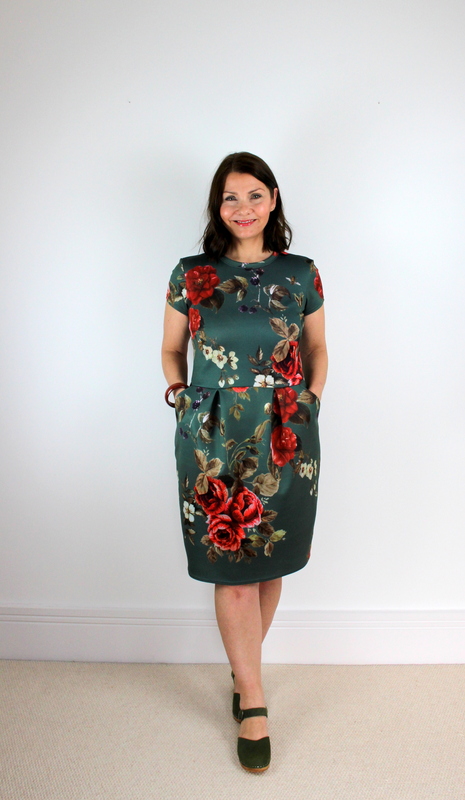 I have talked before about how I love the style and comfort of this dress, and if you would like to read a couple of my previous reviews on this dress you can do so here and here. I have made others, but not blogged them. I have used a moss green scuba fabric which I picked up from The Rag Market in Birmingham last year. It has a bold floral design with the addition of berries, butterflies and bees. … and pockets and pleats. Yay! Previous post: Another Cocowawa Chestnut Sweater, with added bows! Next post: The Mandy Boat Tee from Tessuti Patterns. I, too, shy away from talking about personal issues on my blog, but I really appreciate the support shown by the sewing community. I enjoy reading other people’s stories and it’s truly amazing to see all the love and support they receive from fellow sewists. You’ve made yourself another beautiful dress. It’s such a wonderful pattern, no wonder you’ve made it several times. And the fabric is so pretty. That’s a lovely dress and if you find a pattern that works for you then you can never have too many of them. I have issues around my middle and have found two patterns that suits me and I keep making them again and again. Very true and when you are petite it’s difficult to buy RTW dresses. I hope we meet again one day – I have not made a new sewing friend via Secret a Valentine this year!